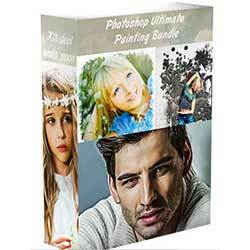 Photoshop Ultimate 4-set Painting Bundle. Create realistic painted photos FAST! StudioMagic I & II - The Ultimate Composting Suite for Photoshop! What is StudioMagic by LayerCake Elements? ● Use the StudioMagic CutOut tool to remove a dull sky and replace it with a brilliant LayerCake sky! ● Use StudioMagic’s Compositor tool to add clouds and rainbows. ● Add drama and excitement with bolts of lightning; or, a calming effect with flocks of birds! ● Use StudioMagic’s LightEffex Tool to add dramatic shafts of light and sunbursts breaking through the clouds! ● Use StudioMagic’s Enviro tool to make rain, change the season or turn daylight to sunset! ● StudioMagic is a massive timesaver for Photoshop users of all levels of expertise. It reduces many of Photoshop’s most difficult tasks to simple one-click fast acting scripts.